Clockwise from top - Miaad Seyed Aliroteh, Prof. Amin Arbabian and Dr Greig Scott in the Pre-polarized MRI Lab. Researchers at Stanford University talk to us about magneto-acoustic imaging, a technique that combines the strengths of existing medical imaging tools; improving safety and the potential for greater compactness and lower cost. Magneto-acoustic (MA) imaging is an emerging medical imaging technique that uses ultrasound to detect Lorentz forces from RF currents flowing in tissue in a static magnetic field. 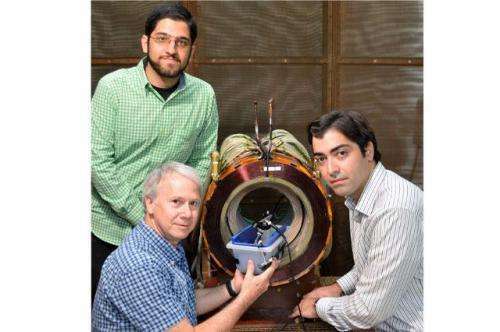 It merges the high spatial resolution of ultrasound with the tissue contrast of electromagnetics. MA imaging also shows potential for portable, low-cost imaging devices and non-destructive testing equipment. Ultrasound imaging has excellent spatial resolution but poor image contrast, as the acoustic properties of most soft tissues are similar. Dielectric properties of tissues are quite variable at low RF frequencies, allowing good contrast, but wavelength is measured in metres, giving very poor resolution. At higher RF frequencies penetration is an issue. In MA imaging, the tissue is placed in a constant, roughly uniform magnetic field. Lower frequency RF currents are introduced in the tissue, roughly perpendicular to the magnetic field. The currents and field interact to produce oscillatory Lorentz forces in the tissues. Ultrasound waves are then generated at tissue conductivity boundaries and can be detected at millimetre resolution. What does MA offer over other medical imaging tools? 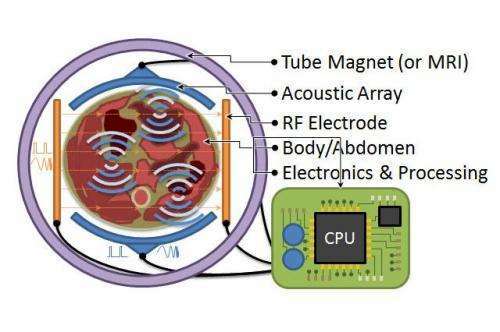 Illustration of a simplified magneto-acoustic imaging system. Unlike PET and CT, MA doesn't use ionising radiation. The magnetic field strength can be much weaker and inhomogeneous compared to MRI, allowing more economical deployments. MA is unique in its ability to generate tissue contrast – cell membrane structure and macroscopic structures, such as blood vessel generation in cancers and necrotic cores, all influence electrical conductivity. MA technology is amenable to silicon integration and miniaturisation, as ultrasound transducers, RF electrodes and electronics for complete tomographic reconstruction can all be produced on silicon. To make this vision a reality, we require a low peak power MA RF excitation technique that can be feasibly integrated on silicon. To reduce peak power but maintain resolution, contrast and SNR, we proposed the use of (step) frequency modulated continuous wave (FMCW/SFCW) RF excitation, instead of pulsed RF excitation. What do you report in your Letter? We have demonstrated that MA imaging can be performed with FMCW/SFCW excitation. This is possible because the ultrasound waves produced by MA Lorentz forces are coherent with the RF excitation. We have shown that with SFCW RF excitation, peak power requirement can be reduced by a factor of 4000 over pulsed excitation; with equivalent resolution, contrast and SNR. Just as modern digital modulation and communication systems revolutionised available capacity, we're applying advanced modulation and DSP techniques to MA in order to fundamentally improve available signal information and hence improve image quality. Past attempts used inefficient, difficult to implement, high power pulsed RF systems. Peak power levels could have been impossible to scale to humans. Excitation and detection intervals had to be separated, as in traditional ultrasound, but MA generates an RF EM signal and detects an acoustic signal. As a result, simultaneous transmission and detection is possible with high SNR and simplified low-power exciters. The simplified exciters are scalable as arrays for interesting spatial encoding arrangements, and could perhaps be integrated in silicon as conformal electronic arrangements. What are the key remaining challenges? In MA, the ultrasound Lorentz force signals are emitted throughout the volume, so spatial encoding must be done purely by surface ultrasound phased array receivers. This requires tomographic reconstruction algorithms and possibly even steerable magnets, so different orientations of tissue boundaries can emit MA signals. Technology now exists to make integrated receive arrays, and a basic system prototype is 3–5 years out. The first application would be in pre-clinical animal scanners, where the electrical contrast capability would open fundamental studies in tumour contrast and MA contrast agents. Since our Letter, we have performed experiments with capacitive non-contact RF excitation electrodes on a multilayer target, successfully detecting the boundary between each layer. We are also in the planning and simulation stage of a small-scale version of the MA system using coin-sized permanent magnets. How do you think this area will develop over the next decade? Technology will drive application integration, allowing higher density ultrasound detector arrays, RF exciters and novel magnet architectures. Bioelectromagnetics will play a role in developing contrast agents. While human scale imaging is the main goal, there are interesting possibilities for micro-scale sensing. Integration of bio- and nanotech on silicon is already popular, particularly in DNA sequencing, and will continue to grow. MA sensing and other on-chip diagnostic techniques will become popular alternatives to the lab-based approach. Medical imaging and diagnostic tools will shift from clinics to bed-sides and then eventually into the home. Similar to "personal computing", this type of "personal medicine" can open the door to new possibilities, the least of which is performing diagnostic tests at home and sending results to our doctors over the internet.